Why Choose Four Town Dental? At Four Town Dental, we like to say that we have the best of both worlds: We’re big enough to handle any dental problem, and we’re small enough that our patients always get personalized attention. 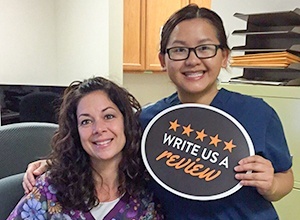 We believe that it’s essential for our team to get to know our patients personally so we can provide dental care that is always customized to their needs, preferences, and goals. Our goal is to form a lifelong partnership with you and to help get things started, your first consultation with us will be absolutely FREE. You can meet our warm and friendly team and get to know our wonderful doctors firsthand. We can also provide a FREE 2nd opinion if you’re already seeing another dentist. After your first visit, we’re sure you’ll see why we’re the perfect place for your smile. Four Town Dental is a 42 North Dental Care, PLLC practice and is owned and operated by dentists Dr. Samuel Shames, DDM. and Dr. Ronald Weissman, DDM. Gentle Dental is supported by 42 North Dental, LLC, a dental support organization that provides non-clinical administrative and business support services to the practice. 42 North Dental, LLC does not own or operate the dental practice or employ dentists to provide dental services. Find more information about 42NorthDental, LLC and the dental practices it supports at 42northdental.com.